Toothpaste: Tom's of Maine, Logona, Weleda, Earthpaste, PerioBrite! Free from synthetic colors, flavors and preservatives and fluoride free. • Natural Toothpaste Cinnamon: Excite your morning routine with this Cinnamon-flavored toothpaste. Made with all-natural ingredients that are vegan and homeopathic friendly, it complements a little bit of spice to your paste. 2.5 oz. ORDER TODAY! • Natural Toothpaste Frosty Mint: Remain fresh with this Frosty Mint flavor. Made with all-natural ingredients, Frosty Mint Toothpaste retains your teeth clean and your breath cool. 2.5 oz. ORDER TODAY! Ingredients: Calcium Carbonate, Aqua/Water/Eau, Sorbitol, Glycerin, Hydrated Silica, Mentha Piperita (Peppermint) leaf Oil, Menthol, Xylitol, Citrus Medica Limonum (Lemon) Extract, Xanthan Gum, Coco-Glucoside, Calcium Ascorbate, Melaleuca Alternifolia (Tea Tree) Leaf Oil. • Natural Toothpaste Green Apple: Green Apple Toothpaste makes brushing your teeth a tasty delight. Made with completely vegan and gluten free ingredients and a touch of apple goodness. 2.5 oz. ORDER TODAY! • Natural Toothpaste Spearmint: Perfect your breath with Spearmint Toothpaste. It is so natural you could safely swallow it. Ezperience the fresh feeling! 2.5 oz. ORDER TODAY! Ingredients: Calcium Carbonate, Aqua/Water/Eau, Sorbitol, Glycerin, Hydrated Silica, Mentha Viridis (Spearmint) Leaf Oil , Xylitol, Citrus, Medica Limonum (Lemon) Extract, Xanthan Gum, Coco-Glucoside, Calcium Ascorbate, Melaleuca Alternifolia (Tea Tree) Leaf Oil. • Natural Toothpaste Zesty Orange: Zesty Orange Toothpaste is ideal for those who enjoy the revitalizing flavor of Citrusy fruits. Made with all-natural ingredients, it's a mouthful of zest that will keep your teeth at their finest. 2.5 oz. ORDER TODAY! Ingredients: Calcium Carbonate, Aqua/Water/Eau, Sorbitol, Glycerin, Hydrated Silica, Aroma (orange natural/naturelle d'orange), Menthol, Xylitol, Citrus Medica Limonum (Lemon) Extract, Xanthan Gum, Coco-Glucoside, Calcium Ascorbate, Melaleuca Alternifolia (Tea Tree) Leaf Oil. ORAL CARE: Natural Toothpaste, 2.5 oz. • Daily Care Toothpaste Peppermint: The mildly foaming Daily Care Organic Peppermint Toothpaste contains mineral cleaning kernels to offer gentle cleaning without damaging the enamel. Made with Chamomile extract to help prevent inflammation of the gums. Peppermint aroma leaves the mouth feeling pleasantly fresh. 2.5 oz. ORDER TODAY! Ingredients: Aqua (Water), Calcium Carbonate, Glycerin, Silica, Sodium Cocoyl Glutamate, Maris Sal (Sea Salt), Xylitol, Chondrus Crispus (Carrageenan), Chamomilla Recutita (Matricaria) Flower Extract, Xanthan Gum, Algin, Mentha Piperita (Peppermint) Oil, Aroma (Flavor), Limonene. • Dental Gel Rosemary & Sage: Rosemary & Sage Herbal Dental Gel is made with organic Rosemary oil and organic Sge oil for sensitive gums and during homoeopathic treatment. The gel is free from surfactants and offers gentle, yet effective cleaning with mineral cleaning kernels. 2.5 oz. ORDER TODAY! Ingredients: Aqua (Water), Sorbitol, Silica, Maris Sal (Sea Salt), Algin, Commiphora Abyssinica Extract, Hamamelis Virginiana (Witch Hazel) Extract, Echinacea Pallida Extract, Rosmarinus Officinalis (Rosmary) Oil, Salvia Officinalis (Sage) Oil, Sucrose Laurate, Glycerin, Aroma, Sodium Hydroxide, Limonene. • Mineral Toothpaste: The mild, fresh Mineral Toothpaste cleans teeth gently yet completely with mineral cleaning kernels. Made with mineral-rich Algae extracts to provide maximum care for teeth and gums. 2.5 oz. ORDER TODAY! Ingredients: Aqua (Water), Glycerin, Sorbitol, Calcium Carbonate, Silica, Sodium Cocoyl Glutamate, Algin, Hectorite, Xanthan Gum, Maris Sal (Sea Salt), Mentha Viridis (Spearmint) Leaf Oil, Mentha Piperita (Peppermint) Oil, Commiphora Abyssinica Extract, Cistus Incanus Extract, Camellia Sinensis Leaf Extract, Eugenia Caryophyllus (Clove) Flower Oil, Algae Extract, Sucrose Laurate, Phytic Acid, Aroma (Flavour), Limonene, Eugenol. • KIDS Dental Gel Spearmint: KIDS Spearmint Dental Gel has been specially developed to meet the needs of sensitive baby teeth, permanent teeth and children’s gums. Mineral cleansing kernels gently remove tooth deposits. Made with organic Chamomile to help protect teeth and gums. 1.7 oz. ORDER TODAY! Ingredients: Water, Sorbitol, Silica, Sodium Bicarbonate, Disodium Cocoyl Glutamate, Sodium Cocoyl Glutamate, Citrus Aurantium Dulcis (Orange) Oil, Commiphora Abyssinica Extract, Mentha Viridis (Spearmint) Leaf Oil, Hamamelis Virginiana (Witch Hazel) Extract, Chamomilla Recutita (Matricaria) Extract, Echinacea Pallida Extract, Glycerin, Xylitol, Xanthan Gum, Aroma, Algin, Phytic Acid, Cl 75810, Limonene. • KIDS Dental Gel Strawberry: KIDS Strawberry Dental Gel has been particularly made to meet the requirements of sensitive baby teeth, permanent teeth and children’s gums. Mineral cleansing kernels mildly remove tooth deposits. Blended with organic Chamomile to help protect teeth and gums. 1.7 oz. ORDER TODAY! Ingredients: Aqua (Water), Sorbitol, Glycerin, Hydrated Silica, Xylitol, Algin, Aroma (Flavour), Montmorillonite, Chamomilla Recutita (Matricaria) Extract, CamelliaSinensis Leaf Extract, Disodium Cocoyl Glutamate, Sodium Cocoyl Glutamate, Maris Sal (Sea Salt), CI 75120 (Annatto). ORAL CARE: Daily Care Toothpaste Peppermint, 2.5 oz. ORAL CARE: Dental Gel Rosemary & Sage, 2.5 oz. ORAL CARE: Mineral Toothpaste, 2.5 oz. ORAL CARE: KIDS Dental Gel, 1.7 oz. Earthpaste Toothpaste: Contains hydrated Redmond Clay and added Xylitol, essential oils, and Real Salt. And that's it. 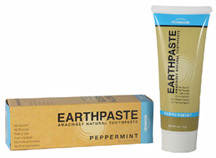 Earthpaste is amazingly natural toothpaste. Does not contain foaming agents like SLS (sodium lauryl sulfate), and chemicals like titanium dioxide to make the paste bright white. Earthpaste delivers all the benefits you expect from a toothpaste without any chemicals or unnatural additives. It's toothpaste unlike any other you've experienced – you'll see the difference on your brush and feel the difference in your mouth. • Earthpaste Toothpaste Peppermint: Peppermint will make your breath smell fresh, and it's widely used to promote stress relief and support digestion. 4 oz. BUY NOW! Ingredient: Purified Water, Food Grade Redmond Clay, Xylitol, Peppermint Essential Oil, Menthol, Redmond Real Salt, Tea Tree Oil. 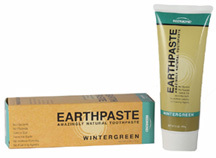 • Earthpaste Toothpaste Wintergreen: Wintergreen lends a sweet, minty flavor and has been used to promote dental health. 4 oz. BUY NOW! Ingredient: Purified Water, Food Grade Redmond Clay, Xylitol, Wintergreen Essential Oil, Menthol, Redmond Real Salt, Tea Tree Oil. • Earthpaste Toothpaste Cinnamon: Cinnamon brings a familiar, spicy flavor along with its reputation as an antioxidant used to promote healthy immune function. 4 oz. BUY NOW! Ingredient: Purified Water, Food Grade Redmond Clay, Xylitol, Cinnamon Essential Oil, Redmond Real Salt, Tea Tree Oil. 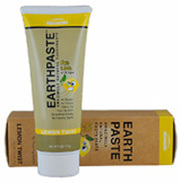 • Earthpaste Toothpaste Lemon Twist: For Kids of all ages! Formulated with Redmond Clay which has a pH of 9.0, which boosts the alkalinity in Earthpaste–and your mouth–and makes even Lemon Twist Earthpaste an amazing, alkaline, experience for your teeth. 4 oz. BUY NOW! Ingredient: Purified Water, Food Grade Redmond Clay, Xylitol, Redmond Real Salt, Lemon Essential Oil, Lemon Verbana Essential Oil, Tangerine Essential Oil, Lime Essential Oil. • Earthpaste Toothpaste Spearmint: 4 oz. BUY NOW! Ingredient: Purified Water, Food Grade Redmond Clay, Redmond Real Salt, Spearmint Essential Oil, Menthol, Tea Tree Oil. (California Residents Proposition 65) WARINING: This product contains trace amounts of lead, a substance known to the State of California to cause birth defects or other reproductive harm. This product may not be appropriate for consumption by children or pregnant women. ORAL CARE: Earthpaste Toothpaste, 4 oz. • Spearmint Toothpaste Fluoride Free 25% Xylitol: Sugar-free, fluoride-free and sweetened with Xylitol, Spearmint Fluoride Free Toothpaste contains 25% Xylitol and uses no fluoride or sodium lauryl sulfate. It's great to prevent tooth decay, plaque, tartar, and pursed lips. Safe for Children. 4.9 oz. ORDER TODAY! Ingredients: Vegetable Glycerin, Purified Water, Hydrated Silica, Xylitol, Natural Flavors, Sodium Lauroyl Sorcosinate, Stevia Rebaudiana Leaf/Stem Extract, Cellulose Gum, Chondrus Crispus (Carrageenan), Calcium Glycerophosphate, Copper PCA, Zinc PCA. ORAL CARE: Spearmint Toothpaste Fluoride Free 25% Xylitol, 4.9 oz. • Organic Toothpaste Ginger Citrus Whitening: Recognized for being anti-inflammatory and antioxidant, Ginger Citrus Whitening Toothpaste is made with invigorating, mint-free Ginger and tasty Citrus for a fresh zingy mouth-feel free to help prevent gum disease. Blended with the cleansing benefits of Baking Soda to help naturally whiten your teeth. Completely free from any harmful ingredients. 3 oz. BUY NOW! Ingredient: Organic Glycerin, Organic Coconut Powder, Agua (Water), Organic Blue Agave, Organic Coconut Oil, Organic Coconut Milk Powder, Calcium Carbonate, Organic Lemon Extract, Organic Rosemary Oil, Organic Ginger Oil, Organic Grapefruit Extract, Organic Guar Gum, Baking Soda, Organic Aloe, Salt, Organic Yacon, Organic Melaleuca Alternifolia Leaf Oil (Tea Tree), Organic Puzzlegrass (Equisetum). • Organic Childrens Toothpaste Coconut Banana: Gentle Coconut Banana Toothpaste tastes like a delicacy while being tough on bacteria and plaque, making it ideal for children 6 months and up. Contains no any trace of chemicals, pesticides, GMOs, glutens, fluoride, saccharin, SLS, SLES, carrageenan, parabens, detergents, or synthetics of any kind. Just clean, natural ingredients that's loved by children and adults alike! 1.7 oz. BUY NOW! Ingredient: Organic Glycerin, Organic Coconut Powder, Agua (Water), Organic Coconut Milk Powder, Organic Coconut Oil, Organic Blue Agave, Organic Banana Flavor, Calcium Carbonate, Organic Cocconut, Flavor, Organic Guar Gum, Organic Grapefruit Extract, Organic Rosemary Oil, Organic Aloe, Organic Yacon, Baking Soda, Organic Puzzlegrass (Equisetum), Salt. ORAL CARE: Organic Toothpaste Ginger Citrus Whitening, 3 oz. ORAL CARE: Organic Childrens Toothpaste Coconut Banana, 1.7 oz. • Ratanhia Toothpaste: Thoroughly cleanse your teeth and care for gums with the gentle power of minerals and natural plant extracts in the Ratanhia Toothpaste. It’s our popular paste that gently cleans your teeth, calms and helps fortify your gums and tastes minty fresh. The astringent properties of organic Ratanhia and soothing Myrrh extracts that naturally clean and tone your modern mouth. Your gums feel revitalized and toned and your smile sparkles from the natural cleansing power of Calcium. 3.2 oz ORDER TODAY! Ingredients: Water (Aqua), Calcium Carbonate, Glycerin, Magnesium Aluminum Silicate, Alcohol, Krameria Triandra (Ratanhia) Root Extract, Commiphora Myrrha (Myrrh) Extract, Mentha Piperita (Peppermint) Oil, Mentha Viridis (Spearmint) Leaf Oil, Foeniculum Vulgare (Fennel) Oil, Xanthan Gum, Ammonium Glycyrrhizate, Limonene. • Plant Gel Toothpaste: Clean teeth, care for sensitive gums and stabilize the normal functions of your mouth with this calming Plant Gel Toothpaste. It’s a gentle way to clean your mouth with natural Silica and help reduce the buildup of plaque. Your sensitive gums are soothed by the mild antiseptic properties of organic Chamomile flower extract. Soothing Myrrh extracts and organic Ratanhia help clean and tone your modern mouth. With the rejuvenating taste of Mint and Citrus fruits, your mouth feels completely refreshed. 3.3 oz ORDER TODAY! Ingredients: Glycerin, Water (Aqua), Hydrated Silica, Chamomilla Recutita Matricaria (Chamomile) Flower Extract, Krameria Triandra (Ratanhia) Root Extract, Commiphora Myrrha (Myrrh) Extract, Mentha Viridis (Spearmint) Leaf Oil, Mentha Piperita (Peppermint) Oil, Foeniculum Vulgare (Fennel) Oil, Algin, Alcohol, Esculin, Limonene. • Salt Toothpaste: Teeth in need of a whitening scrub-down get sensational cleaning with the remarkable Salt Toothpaste. It’s a full oral cleansing that helps prevent the buildup of plaque and cares for your gums. Made with Sea Salt to create a powerful natural cleanser and whitener for your teeth. Your gums are purified and stimulated by organic Blackthorn flower extract. Soothing Myrrh extracts and organic Ratanhia help clean and tone your modern mouth. You’re left with brilliant, white teeth in a refreshed and healthy mouth. 3.3 oz ORDER TODAY! Ingredients: Sodium Bicarbonate (Salt), Water (Aqua), Glycerin, Silica, Mentha Piperita (Peppermint) Oil, Prunus Spinosa (Blackthorn) Fruit Juice, Commiphora Myrrha (Myrrh) Extract, Krameria Triandra (Ratanhia) Root Extract, Aesculus Hippocastanum (Horse Chestnut) Bark Extract, Arum Maculatum Root Extract, Sodium Chloride (Salt), Cyanopsis Tetragonoloba (Guar) Gum, Simmondsia Chinensis (Jojoba) Seed Oil, Alcohol, Esculin, Flavor (Aroma), Limonene, Linalool. • Calendula Toothpaste: Teeth and gums are completely cleaned and cared for with the gentle power of minerals andnatural plant extracts in the Calendula Toothpaste. It’s a Peppermint-free oral treatment that keeps your mouth fresh and helps prevent the buildup of plaque with regular use. Your gums are cleaned and calmed by the mild antiseptic and anti-inflammatory properties of Biodynamic® and organic Calendula flower extract. Myrrh extract has been used for centuries as an oral disinfectant. Your mouth feels naturally clean without the residue of fluoride and synthetic detergents. Smile with a mouthful of happy, healthy teeth. 3.2 oz. ORDER TODAY! Ingredients:Water (Aqua), Calcium Carbonate, Glycerin, Magnesium Aluminum Silicate, Alcohol, Calendula Officinalis Extract, Commiphora Myrrha (Myrrh) Extract, Foeniculum Vulgare (Fennel) Oil, Xanthan Gum, Ammonium Glycyrrhizate, Limonene. • Childrens Tooth Gel: Children's Tooth Gel is made with Silica to gently cleanse and the calming properties of organic Calendula flower extract soothe tender gums. Fluoride-free natural baby toothpaste completely cleans your child's whole mouth and is safe to swallow. The mild flavors of Spearmint and organic Fennel in the Children's Tooth Gel help promote your child's good dental hygiene to last a lifetime. Clean, white baby teeth, naturally soothed gums and fresh, minty breath. 1.7 oz. ORDER TODAY! Ingredients: Glycerin, Water (Aqua), Silica, Algin, Calendula Officinalis Flower Extract, Prunus Amygdalus Dulcis (Sweet Almond) Oil, Esculin, Flavor (Aroma), Limonene. Cavity Protection Fluoride Toothpaste: Natural Cavity Protection Fluoride Toothpaste is ADA-accepted, so you can trust it to help prevent and reduce tooth decay when used as directed. Naturally sourced fluoride helps re-mineralize soft spots before they turn into cavities, and it helps strengthen the tooth structure so enamel is more resistant to decay. • Peppermint Baking Soda: 5.5 oz. BUY NOW! • Spearmint: 5.5 oz. BUY NOW! "Tom's of Maine natural fluoride toothpastes - Fennel, Spearmint, Cinnamint, Silly Strawberry, Outrageous Orange-Mango, Wintermint - have been shown to be effective decay-preventive dentifrices that can be of significant value when used as directed in a conscientiously applied program of oral hygiene and regular professional care." Sensitive Toothpaste: Sensitive Toothpaste has the same FDA-allowed anti-sensitivity ingredient as other toothpastes but instead of using synthetic Potassium Nitrate, we found a way to derive it from naturally occurring Nitrate ore. That's the Tom's of Maine difference. • Maximum Strength Sensitive Soothing Mint Fluoride: Contains Fluoride for cavity prevention. 4 oz. BUY NOW! • Antiplaque & Whitening Fluoride FreeSpearmint Whitening Gel: Made with Zinc Ctcitrate sourced from Zinc – a naturally occurring mineral – and Xylitol, a natural ingredient derived from birch trees or corn. Plus, natural flavors for a taste that will make you look forward to brushing! 4.7 oz. BUY NOW! Active ingredient: Sodium flouride 0.24% (0.15% w/v flouride ion). Inactive ingredients: hydrated silica, water, sorbitol, glycerin, xylitol, sodium lauryl sulfate, natural flavors, xanthum gum, titanium dioxide, Chondrus crispus (carrageenan). Wicked Cool Toothpaste: Wicked Cool! Fluoride-free toothpaste features a mild mint flavor for kids who have outgrown fruit or bubblegum flavors but don't like the strong mint flavors found in many adult toothpastes. Wicked Cool! toothpaste is ADA-accepted to help prevent cavities, and it also strengthens enamel and freshens breath. Wicked Cool! cleans gently and freshens breath. Has no artificial dyes, sweeteners or flavors. Made for Kids 8+. • Wicked Cool Mild Mint Fluoride: 4.2 oz. BUY NOW! • Wicked Cool Mild Mint Fluoride Free: 4.2 oz. BUY NOW! ORAL CARE: Wicked Cool Toothpaste, 4.2 oz. Simply White Toothpaste: Smile with Natural Confidence. The key to our effective formula is our natural silicas, derived from sand to improve cleaning and to gently whiten without bleaching ingredients or harsh abrasives. Simply White toothpaste helps to restore the natural whiteness of your teeth. Try Simply White for a bright, healthy smile that shows your natural confidence! • Clean Mint Paste: 4.7 oz. BUY NOW! • Sweet Mint Gel: 4.7 oz. BUY NOW! Now you can have an SLS-free whitening toothpaste you love! Brushing with new Tom's of Maine Botanically Bright gives your mouth a foamy, clean feeling, tastes great and helps whiten your teeth by removing surface stains. Available in Spearmint with Aloe & Chamomile and Peppermint with Xylitol and Propolis. • Peppermint: Made with Peppermint, Xylitol, and Propolis.4.7 oz. BUY NOW! • Spearmint: Made with Spearmint, Aloe, and Chamomile. 4.7 oz. BUY NOW! ORAL CARE: Simply White Toothpaste, 4.7 oz. ORAL CARE: Botanically Bright Fluoride Free Whitening Toothpaste, 4.7 oz. Propolis & Myrrh Fluoride Free Toothpaste: Leave your mouth feeling naturally fresh! We've found that the herbal Resins Propolis and Myrrh promote a naturally clean, healthy-mouth feeling. Our Propolis and Myrrh toothpastes help fight plaque with regular brushing, and we've added Xylitol for great taste. • Cinnamint: 5.5 oz. BUY NOW! ORAL CARE: Propolis & Myrrh Fluoride Free Toothpaste, 5.5 oz. Whole Care Gel: Help fights cavities, whitens with naturally sourced Silicas, freshens breath, and helps prevent plaque and tartar buildup with regular brushing. • Orange Mango: 4.7 oz. BUY NOW! • Spearmint: 4.7 oz. BUY NOW! ORAL CARE: Whole Care Gel, 4.7 oz. Whole Care Toothpaste: Help fights cavities, whitens with naturally sourced Silicas, freshens breath, and helps prevent plaque and tartar buildup with regular brushing. • Cinnamon Clove: 4.7 oz. BUY NOW! • Peppermint: 4.7 oz. BUY NOW! • Wintermint : 4.7 oz. BUY NOW! • Spearmint : 4.7 oz. BUY NOW! ORAL CARE: Whole Care Toothpaste, 4.7 oz. Wicked Fresh Toothpaste: Contains Licorice Root extract in our Wicked Fresh! Toothpaste actually helps block bad breath germs from producing odor, for long-lasting fresh breath. • Cool Peppermint: 4.7 oz. BUY NOW! • Spearmint Ice: 4.7 oz. BUY NOW! ORAL CARE: Wicked Fresh Toothpaste, 4.7 oz. • Silly Strawberry Fluoride Free: Because it's fluoride-free, you won't have to worry if more toothpaste ends up in your child's tummy than in the sink! 4.2 oz. BUY NOW! Ingredient: Glycerin, Water, Calcium Carbonate, Hydrated Silica, Natural Flavors, Chondrus Crispus (Carrageenan), Sodium Lauryl Sulfate. • Toddler Training Toothpaste Fluoride Free: Toddler Training toothpaste is fluoride-free with no artificial flavors, colors or preservatives. This clear gel gently cleans little teeth and gums without SLS or propylene glycol. Toddlers will love brushing with the great-tasting, mild fruit flavor again and again. Easy-to-use, no-mess dispensing top. Safe if swallowed. Specially formulated for 3 to 24 months. 1.75 oz. BUY NOW! Ingredient: Glycerin, Propanediol, Hydrated Silica, Water, Xylitol, Benzyl Alcohol, Carrageenan, Natural Flavor, Citric Acid. ORAL CARE: Children's Toothpaste, Strawberry Fluoride Free, 4.2 oz. Toddler Training Toothpaste Fluoride Free, 1.75 oz. Ingredients: Phytoplenolin (Centipeda Cunninghamii Extract), Bio-Chelated Extracts of Echinacea Purpurea Tops (Echinacea Purpurea), Calendula Flower (Calendula Officinalis), Olive Leaf (Olea Europaea), Black Walnut Green Hulls (Juglans nigra), Gotu Kola Herb (Centella Asiatica), Chamomile Flower (Chamomilla Recutita (Matricaria), Green Tea Leaf (Camellia Sinensis), Prickly Ash Bark (Zanthoxylum Americanum) and Grapefruit Seed (Citrus Grandis), Essential Oils of Peppermint,(Mentha Piperita) Oregano (Origanum Vulgare), Clove (Eugenia Caryophyllus), Thyme (Thymus Vulgaris), Lavender (Lavendula Angustifolia), Cinnamon (Cinnamomum (Zeylanicum) and Eucalyptus (Eucalyptus (Globulus), Bio-Saponin (Saponins), Folic Acid, Coenzyme Q10 (Ubiquinone), Aloe Vera Phytogel (Aloe Barbadensis), Sodium Bicarbonate, Hydroxyethylcellulose, XanthanGum, and Chlorophyll. ORAL CARE: PerioBriteToothpaste, Cool Mint 4 oz. • Organic Teething Gel: Safe, Organic Teething Gel is made with the naturally soothing properties of Peppermint Oil, Licorice, Fennel, Chamomile and Vanilla to instantly pacify the discomfort related with teething and calms irritated gums. Organic Teething Gel is an all-natural, non-medicated and non-habit forming formula; does not contain Benzocaine or Clove which can cause allergic reactions or choking in infants, nor does it contain Sugar or Lactose. CAUTION: Use under adult supervision. Do not use more than directed. 0.33 oz. BUY NOW! Ingredient: Aloe Barbadensis Leaf Juice, Aqua (Water), Gylcerin, Polyglycerol-10 Laurate, Chamomilla Recutita (Matricaria) Flower Extract, Glycyrrhiza Glabra (Licorice) Root Extract, Stevia Rebaudiana Leaf/Stem Extract, Vanilla Planifolia Fruit Extract, Mentha Piperita (Peppermint) Oil, Alcohol, Algin, Menthol, Potassium Sorbate, Sodium Benzoate, Xanthan Gum. • Toddler Toothpaste Apple Pear: Natural Toddler Toothpaste is made with delicious all-natural Strawberry & Banana flavors, and Calcium Lactate to safely and gently cleanse delicate gums and encourage strong teeth. Fluoride-free formula makes this toothpaste completely safe if swallowed. Contains Oat Bran, Beta-Glucan & Vitamin B5. For 6 months to 3 years. 1.7 oz. BUY NOW! Ingredient: Glycerin, aqua (Water), Xylitol, Panthenol, Cellulose Gum, Avena Sativa (Oat) Bran, Beta-Glucan, Calcium Lactate Flavor. • Toddler Toothpaste Strawberry Banana: Toddler Toothpaste Strawberry Banana is made with food grade Oat Beta Glucan and Vitamin B5 to calm teething aches. Safely and gently cleans while Calcium Lactate helps encourage healthy gums and strong teeth. Use daily to develop an oral hygiene routine. Fluoride-free formula makes this toothpaste safe if swallowed. Delicious Strawberry and Banana Flavor! FREE gum brush. For ages 6 months to 3 years. 1.7 oz. BUY NOW! Ingredient: Vegetable Glycerin, Aqua (Purified Water), Xylitol, Panthenol (Vitamin B5), Cellulose Gum, Oat Beta-Glucan, Calcium Lactate, Natural Strawberry and Banana Flavor. ORAL CARE: Organic Teething Gel, 0.33 oz. ORAL CARE: Toddler Toothpaste, 1.7 oz. Berry Smart Toothpaste: Made with Cranberry, Aloe and Tea Tree extracts to encourage clean teeth. Cranberry extracts with powerful antioxidants help fight plaque and promote a healthy mouth and gums. A berry flavor kids will love, available with and without fluoride. • Berry Smart Toothpaste With Flouride: Supports in the prevention of dental cavities. 4 oz. ORDER TODAY! Active Ingredients: Sodium Monofluorophosphate 0.76% Anticavity. Inactive Ingredients: Vegetable Glycerin, Purified Water, Hydrated Silica, Zinc Citrate, Xylitol, Natural Flavors, Vaccinium Macrocarpon (Cranberry) Fruit, Aloe Barbadensis Leaf Juice, Chondrus Crispus (Carrageenan), Melaleuca Alternifolia (Tea Tree) Oil, Stevia Rebaudiana Leaf/Stem Extract, Caccinium Macrocarpon (Cranberry) Seed Oil, Sorbic Acid. • Berry Smart Toothpaste Without Flouride: 4 oz. ORDER TODAY! Ingredient: Glycerin, Aqua, Hydrated Silica, Zinc Citrate, Xylitol, Natural Flavor, Vaccinium Macrocarpon(Cranberry Fruit), Aloe Barbadensis (Leaf Juice) Chondrus Crispus(Carrageenan), Melaleuca Alternifolia (Tea Tree Leaf Oil), Sorbic Acid, Stevia Rebaudiana(Leaf/Stem Extract), Vaccinium Macrocarpon (Cranberry Seed). ORAL CARE:Berry Smart Toothpaste, 4 oz.